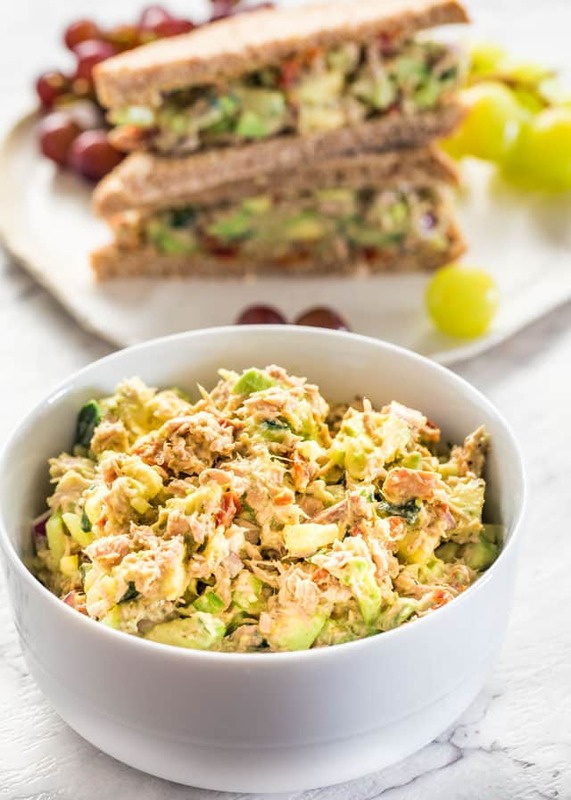 This Avocado Tuna Salad is so delicious and loaded with good stuff such as chunks of tuna, avocados, cucumbers and my secret ingredient, sun-dried tomatoes! 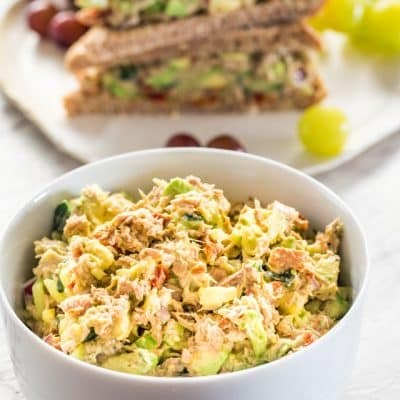 This avocado tuna salad is creamy, full of nutrients and perfect for lunch. 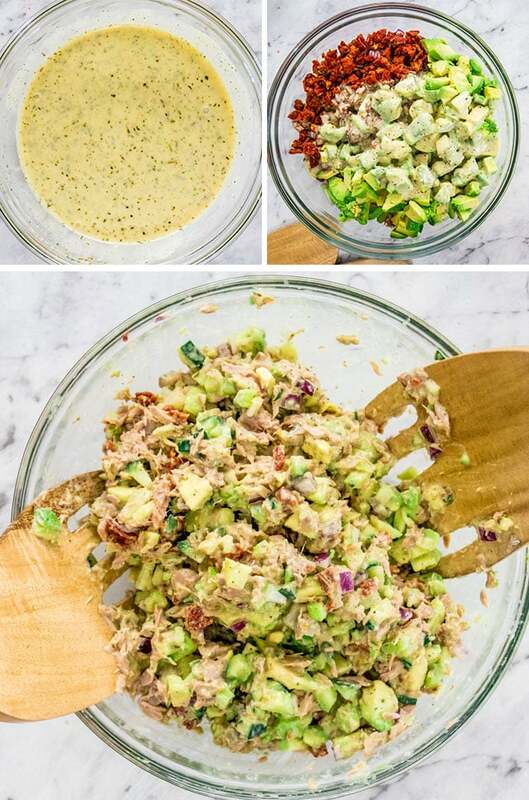 Tuna salad is one of those dishes I make year round, regardless of season, but a couple years ago I started making this avocado tuna salad and I’ve been making it ever since. Both hubs and I love it, it’s so quick to put together, and it makes for a great lunch. You can find my tuna salad recipe here. The great thing about these types of salads is that they are quite versatile. Not only can you add ingredients you love but you can serve it up in a sandwich or a wrap, or over a bed of greens. I love it, it’s easy to make and perfect for meal prep! I love this dressing and while I change it around sometimes, this is the base of it. I love it because it’s creamy and it’s so full of flavor. However, you could skip the mayonnaise if you wanted to, I’ve made it both ways, and I’ve also used vegenaise before and couldn’t really tell the difference. I also used a tarragon Dijon mustard, which I love, but plain mustard works as well. But my special ingredient here is the sun-dried tomatoes. 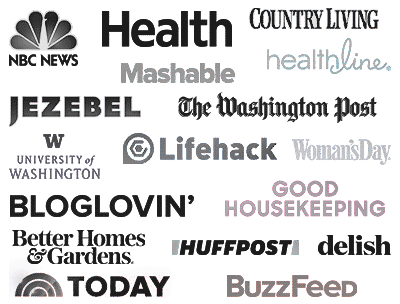 While you might think it’s a weird ingredient to add to avocado tuna salad, they really do work. They add a bit of sweet-tart flavor to the salad and a bit of chewy texture. Trust me, you just have to try it. I love to serve this with toasted bread or make a sandwich, but many times I even just like it on its own. 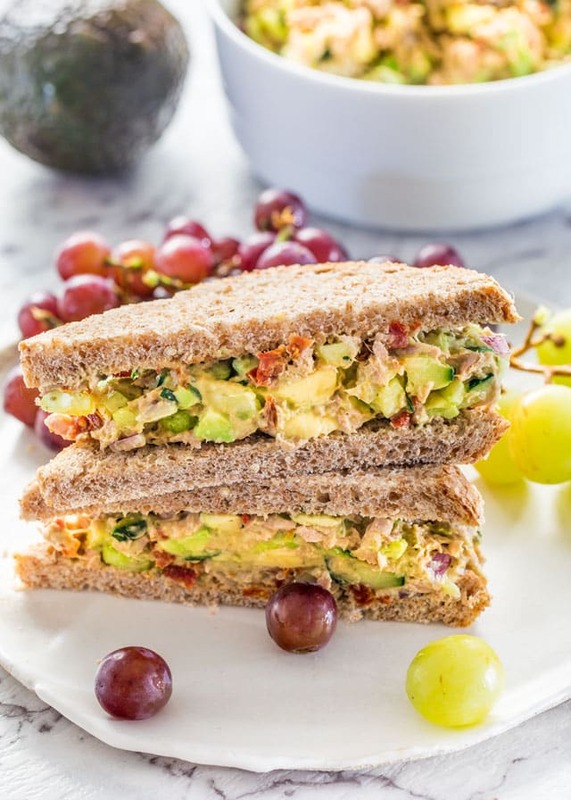 Give it a try, it’s so delicious and avocados and tuna go really well together. Store leftovers in an airtight container for up to 2 days. Mine hasn’t turned brown because of the avocados, however save the avocado pit and stick it in the container. It helps to make sure it stays green. In a small bowl whisk all the dressing ingredients together. If you find it's a little to thick add a tbsp or so of water to thin it out. In another large bowl add all the salad ingredients and drizzle the dressing over. Toss well. Serve as sandwiches or as salad. Store leftovers in an airtight container for up to 2 days. Mine hasn't turned brown because of the avocados, however save the avocado pit and stick it in the container. It helps to make sure it stays green. Did you use sun dried tomatoes with oil or without oil in this recipe. I used the ones that come in a jar with oil, but I drained them. Don’t throw away that oil, add it to salads, it’s really delicious! avocado as that is what I had but still marvelous!! I’m so glad you guys enjoyed this recipe! Thanks for letting me know! This was AMAZING! I make my own mayonnaise so just added some pureed avocado to the creamy goodness. I’m thinking this would be a perfect greens topper for those times I don’t want to do bread. Oooooo… for a pasta salad! Jo, you are a marvel! Simple and yummy. I try to make it weekly. Everyone loves it! Fantastic! 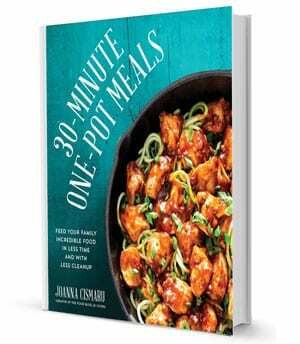 This recipe is a big hit in my home as well. What a lovely salad recipe. I saw the video from the beginning to end. The process is simple but the taste is exceptional. I loved the way you explained each and everything clearly. Thanks for sharing such a wonderful recipe.